A concert entitled “From Ho Chi Minh City towards Thang Long-Hanoi” will be held at the municipal Opera House on May 20. Music lovers will have a chance to enjoy 18 songs praising the capital. They are selected works of famous musicians in a composition contest, organized by the HCMC Cultural Center of the Department of Culture, Sport and Tourism to mark the grand celebration of the 1000th birthday of Thang Long –Hanoi. 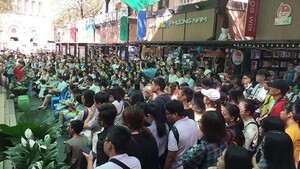 The organizer will also release 6,000 Cds and 3,000 songbooks and cooperate with HCMC Television, Voice of HCM City's People radio station, cultural centers, HCMC Music Association, HCMC Youth’s Cultural House and more organizations to popularize these works more widely throughout the community. Songs includes Nho ve nghin nam Thang Long-Hanoi (Remembering of thousand-year Thang Long-Hanoi) by Ton That Lap, Cam xuc ben ho (Feeling on lakeside) by Tran Long An, Nho Bac (Remembering of the North) by Le Van Loc, Chieu qua cau Long Bien (Walking on Long Bien Bridge in evening) by Nguyen Van Hien, Nho Thang Long-Hanoi (Remembering of Thang Long-Hanoi) by Nguyen Ngoc Thien, Tim Lai dau xua (Finding ancient vestige) by Pham Dang Khuong, Bai ca Dai Viet (Dai Viet song) by The Bao, Phuong Nam huong ve Thang Long (The South towards Thang Long) by Nguyen Duc Trung, Rong bay (Flying dragon) by Pham Minh Tuan, Thang Long khat vong ngan nam (Thang Long, a thousand-year aspiration) by Le Quang and others. Well-known singers such as Dan Truong, Thanh Thuy, Quang Linh, Dong Quan, To Thanh Phuong, Ho Bich Ngoc, Bonneur Trinh, Xuan Phu, Vo Ha Tram, and the bands XMen, Titikid, TVT and more, will perform the patriotic songs.